As you may be able to tell, I have taken this month’s theme of From The Tree quite literally. I was very impressed by Georgia and Emily‘s ability to think laterally with the choice of venue for this month’s Total Food Geeks dinner, Lebanese and Kurdish restaurant Hanam’s (the Lebanese flag being distinguished by a large tree). I was super impressed with Edinburgh Foody’s genius post on Favourite Kitchen Tools as well. When I thought about the theme, making something that looked like it had just come from the tree appealed to me. These glossy red apple cupcakes certainly fit the bill and they are also delicious – spiced apple cupcakes with caramel cream cheese icing covered in shiny red fondant. 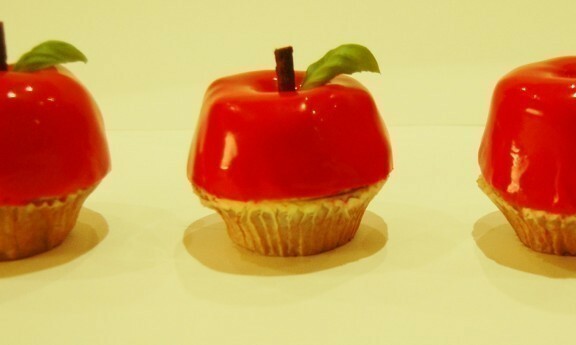 They’re lovely to look at and perfect if you like a lot of icing with your cupcake as you need a good spoonful to create the apple ‘dome’ shape on top – they’re also really fun to eat! A quick and easy alternative to covering the cupcakes in fondant is to dip the iced cupcakes into red sugar crystals. This is dead simple and looks quite pretty, but I do prefer the look of the shiny apples more. The sugar crystals should be available in the baking section of the supermarket (I bought mine from the Asda in Leith for 70p). The recipe for the cupcakes is from one of the best and most imaginative cupcake blogs on the net, Cupcake Bakeshop. As well as being deliciously spiced and full of apple chunks they should also have quite a high dome once baked, which helps with making the shape of the apple. The cream cheese icing is also spiced with cinnamon and caramel syrup, a classic pairing with an apple bake. If you’re unable to find caramel syrup just use vanilla extract. The icing needs to be quite firm to shape into apples and the recipe below should only be beaten until the desired consistency is reached, otherwise it could go runny. I would recommend buying cream cheese in ‘brick’ form if you can rather than in a tub, as it’s slightly more creamy for spreading. I find it easier to make a smooth buttercream and then add softened cream cheese by hand, it should hold its shape quite well with this method. Preheat the oven to 170 degrees Celcius. Rinse, peel and core the apples. Place them on an ovenproof pan or baking sheet and bake for 30-40 minutes until soft. Remove the apples from the oven, let cool slightly, and mush the apple with the back of a fork. Measure out 1 cup of apple and set aside to cool. Note: you could skip these two steps and use 1 cup of chunky unsweetened apple sauce instead. Sift the flour, sugar, ginger, cinnamon, nutmeg, baking soda and salt in a medium sized bowl. Crack the eggs into a separate large bowl and beat with a fork to break up. Add the oil, apple juice, vanilla and cooled apples and mix to combine. Add the dry ingredients to the wet ingredients, combine until all ingredients come together. Do not overmix as the mixture can become tough. Scoop into cupcke papers about 3/4 full so cupcake will have a significant dome. Bake at 170 degree Celcius for 20-22 minutes, rotating the pan after 15 minutes, until a toothpick comes out clean. Mix together butter, icing sugar, cinnamon and caramel syrup toegether in a medium bowl with electric beaters until creamy. Add in the cream cheese and beat at medium speed until just mixed together. The icing should be creamy but firm. * Red coloured fondant should be available from the baking section of the supermarket, otherwise you will have to colour white fondant using red food colouring gel – a good tutorial for doing this is available here. The first step is to make a rounded shape on top of the cupcake with a dimple on top where the stalk should be. Trim the sides of the cupcake and then add rounded scoops of the icing on top of the cake, scooping out a small amount in the centre of the stalk. Another method of doing this is using mini-donuts – this gives the apples a nice rounded shape. This isn’t something I particularly would like to eat but I’m sure it appeals to some folk! Add a thin layer of icing to the cake and then pop a mini-donut on top and cover again with a layer of icing. Once the icing has been added, pop the cakes into the fridge for at least an hour so it can firm up. Before adding the fondant, take them out of the fridge and using a knife dipped in hot water, smooth the edges as much as possible so there’s a good base for the fondant to sit on. Take a large pink of the red fondant and roll out to a thin consistency, about an eighth of an inch. There should be enough to cover the top of your domed cupcake and complete encase the icing. Smooth the fondant down carefully to prevent air bubble or folds of fondant forming down the sides and then trim just where the fondant meets the paper cupcake case. Break a small amount of Matchmaker to stick on top for a stalk and add a mint or basil leaf and you have an apple cupcake! To get a shiny rosy red effect on the fondant, carefully brush on a small amount of vodka. Don’t use too much or it will change the consistency of the fondant. I mixed the vodka with a few drops of red food colouring to intensify the colour.